The Campground Road extension is under construction and will open by Christmas 2018, weather permitting. The Board of Commissioners approved the $13 million dollar construction contract on March 7, 2017. 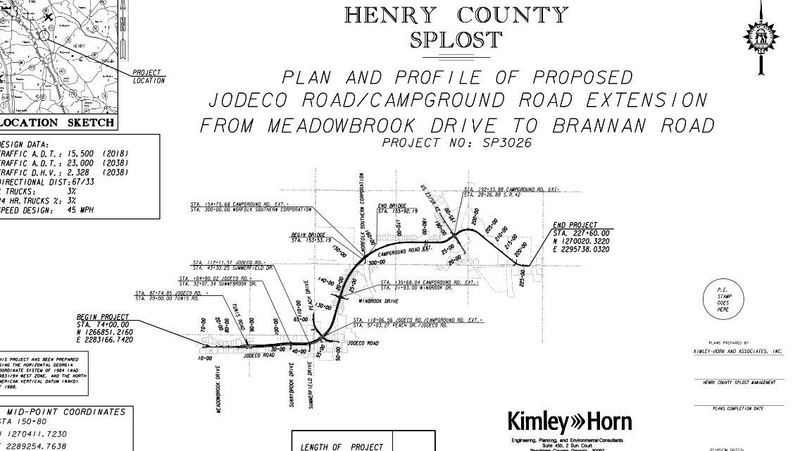 Funded 100% by Henry County sales tax dollars, the project will dramatically improve the flow of traffic on Jodeco Road. The project will relieve congestion along Jodeco Road and the bottleneck created on US 23 / SR 42 between Campground Road and Jodeco Road. The project will realign the Campground Road at US 23 / SR 42 intersection to move it further north and connect Campground Road to Jodeco Road. In addition, Jodeco Road will be widened to four lanes between I-75 and the new Campground Road at Jodeco Road intersection. While only two travel lanes on Campground Road are being completed now, the project is designed to be four lanes for its entire length. All other elements of the project; including right-of-way, utilities, stormwater, and the bridge over the Norfolk Southern railroad; are being built now to handle the eventual four lanes. This will greatly minimize the future construction costs to complete the long-term vision.